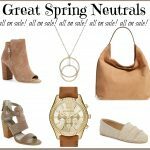 Did y’all see my FABULOUS MARCH AMAZON FINDS post last week? I thought February’s was the best one yet, but then there was March. I don’t know if the stuff is getting better, or if I’m just getting better at shopping Amazon fashion, but I’m having the best time finding so many Amazon treasures! You can click HERE to see all of my previous Amazon posts. If you haven’t seen them previously, I recommend just scrolling through them super quickly to see if anything catches your eye! In fact…there was so much great stuff this month, I didn’t even get to all of it in last Friday’s post. I showed you 2 show stopping tops in flat lays, but I lost daylight before I could photograph them on me. I had lots of requests to see them on, so today is the day! Remember this flat lay? Sooooo cute, right? The embroidery work is GORGEOUS. And when you put the top on, it’s a total show stopper, or what I often refer to as an outfit maker. Outfit makers are special items that easily become the star of an outfit. And this top is no doubt the star. 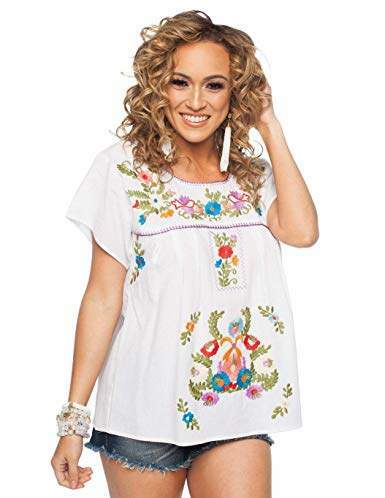 I love how it’s embroidered across the top and on the sleeves. And the sleeves and the neckline are finished off nicely with some tiny little ric rac. It’s amazing quality and such a wonderful piece. It’s definitely more expensive than a regular shirt, but it should be. I’m a firm believer in the fact that some special pieces demand higher prices. And if it’s something that you know you will wear a lot, you can sometimes justify the higher price. I ordered a small, but the darts pull a little bit, so I’m going to size up to a medium. If you aren’t large chested (and kind of broad chested like me), you can for sure stick to your regular size. The small didn’t feel small on me, but the pleats just didn’t lay flat. I got a lot of questions about the earrings and if they are super heavy. Great news, they aren’t! They aren’t as light as our beloved Gorjana hoops or anything, but I am able to wear them without any issues. And since the pink one I’m highlighting above is now low on stock, I wanted to show you two more! I love the blue too. And the multi color is so festive. And while we are on the topic of embroidered tops, remember this one from Cassie’s line? The best part about it is that it’s incredibly soft. Light blush with a coral/red embroidery! YES, PLEASE! This color combo is so pretty and feminine. Blush is one of my favorite colors, and I especially love it when paired with red, so I was thrilled when they added this combination to the line. 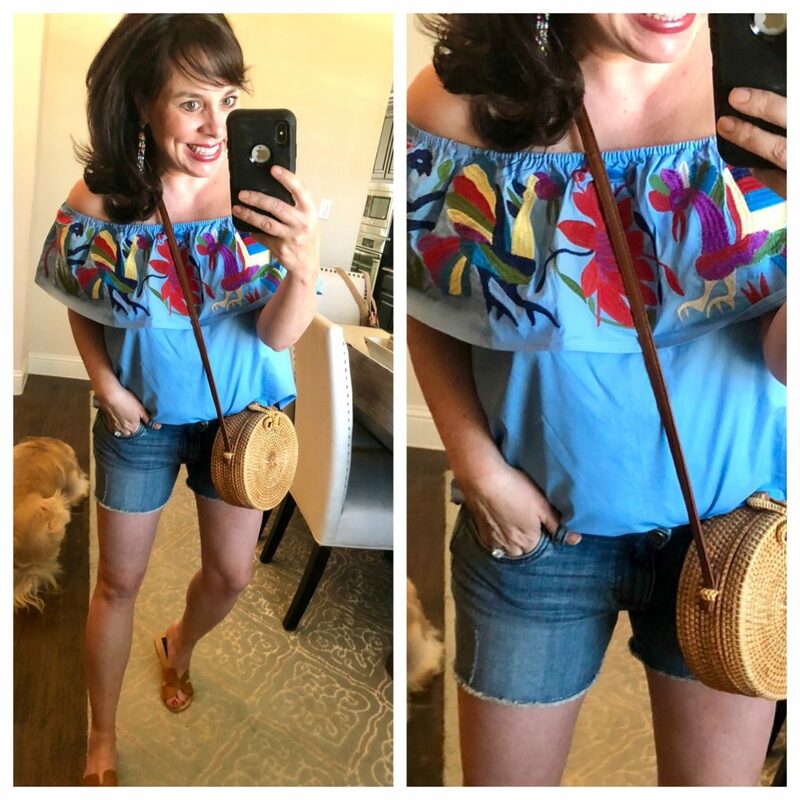 The frayed hem denim shorts have great reviews, and they are true to size for me. You’ll see them on me in just a second. 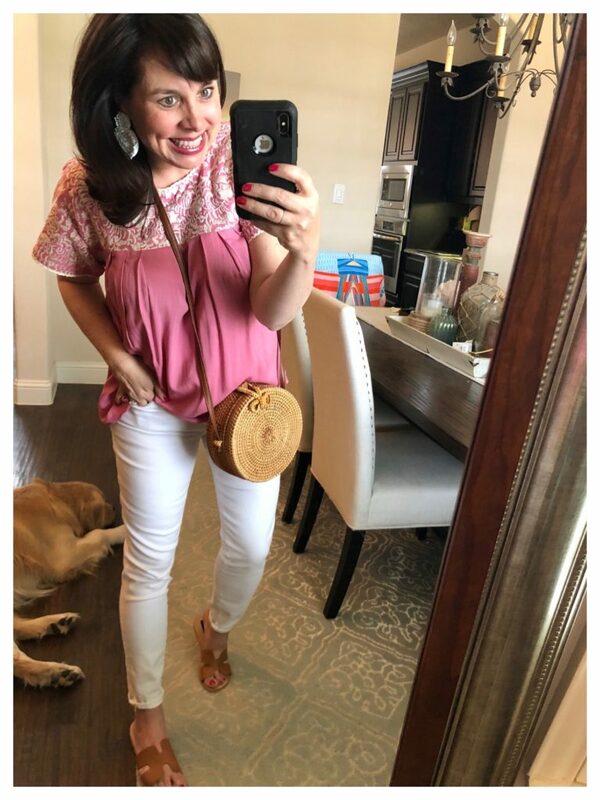 I decided to keep the color palette simple with this outfit, and the earrings and clutch complimented the tee perfectly! And check out this dress! DARLING! I’m always a sucker for embroidery. Here’s the other top from last Friday’s post. This one is a total show stopper too. The colors are vibrant, and the embroidery work is absolutely stunning. 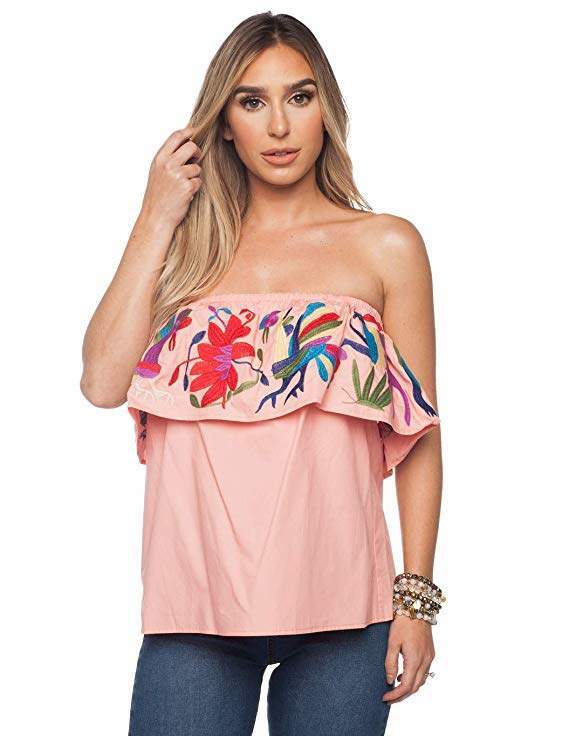 I’ll for sure be wearing this off the shoulder, but the description says you can wear it strapless as well (although I tried it and I didn’t love it this way). I got a small in the top. Heads up: if you are really long waisted, this one might not work for you. As a Kut from the Kloth brand ambassador, these shorts are the item I’m featuring this week. 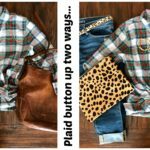 I love the fit, I love the frayed hem, and just imagine how great they’ll look with a tan! I’m wearing a 4, so they are true to size for me. I loved the top with the white jeans as well. The above top comes in a really pretty salmon color too. And this shot shows how it can also be worn strapless! For those of you that are new here, THIS STRAPLESS BRA is the be all, end all. I wear it even when I don’t have to wear a strapless. It really is that good. I have 2 other things I want to feature today that I found while browsing The Red Dress Boutique (which is where the dress is from above). I would order it, try it, and then show y’all…but history has shown that the items on this site sell out much too fast for that. So instead, I’m just going to highlight them so you know about them (before they’re gone)! This dress. This dress is very me. I love the swingy fit and the flutter sleeves. 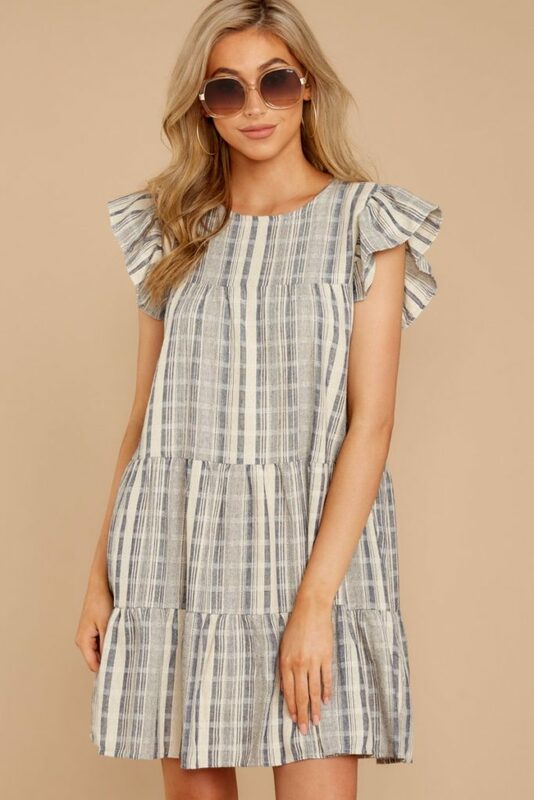 It will be perfect with my must have wedges, and one of my must have denim jackets too if it’s cool, because I wouldn’t want to cover up the sleeves otherwise. I think both the stonewashed version and the white denim would both be great with this dress. And as soon as my summer body is ready, I’m going to want this top. That’s all for the fashion today, but I now have a bit of a life update that I want to give y’all! I realized yesterday that although I’ve talked about it on instastories, I haven’t mentioned on the blog that I got Invasalign. I’ve received lots of questions about it after storying about my new braces, so I thought I’d answer some of those questions today! Why did you get them? After 20 years of not wearing retainers, my teeth started moving. UGH! Apparently this is actually quite common with age. Double UGH! Even though my bottom teeth started moving a bit, they didn’t really bother me. HOWEVER. I started developing a space between my front two teeth, and the space is what pushed me to get the braces. I would have dealt with the movement of my lower teeth, but I wanted to fix the front gap. What is the assessment like? This is wayyyyyyyy different than how I remembered it. None of that awful mold material we used to have to bite down on as kids. They literally put a wand in my mouth and scanned all around it to create a 3D image on a screen. They also took x-rays. A treatment plan was created based upon the scan and the x-rays. Do they hurt? I’m on my 2nd set of trays, and the first set of trays hurt much worse, but it was wasn’t unbearable. My teeth are always tender the first several days of new trays, but that goes away as the teeth start moving. How long will you have to have them? My treatment plan includes 7 months worth of trays. The length of treatment is dependent upon the issues you need to fix. I think I remember the tech saying that 6 months is the shortest amount of time she had seen, and that she had a couple of patients who had to wear them as much as 36 months (although that’s MUCH longer than most). Are they hard to get on and off? Funny enough, they aren’t hard to get on at all. They just pop right in! Getting them off is another story. I did have a reader suggest a tool for me to get from Amazon to help with the removal, but I can’t find the message. If it was you or if you know of a tool, please leave a comment. I tried to search for one, and I came up empty handed. How often do you wear them? 22 hours a day. I only take them off to eat. How do you clean them? I was told not to use toothpaste because it’s too harsh, so I brush them with diluted Dawn soap (as recommended). I was worried they would taste soapy, but after a thorough rinsing they don’t. I also bought the effervescent tabs people use when they clean their dentures. I feel like this helps them get extra clean. How much do they cost? This varies based upon your ortho, your insurance, and the length of your treatment plan. I’m totally guessing here and want to make it clear that I really have no idea, but I think you should expect to pay between about $3,000-$6,000. We paid right in the middle of that. Obviously, just get a quote from your ortho/dentist! How long do you wear each set of trays? I think 2 weeks per set of trays is average. Apparently towards the end you might only have to wear the trays for 1 week at a time, although that’s not necessarily common. We’ll see! Do you have to go to the orthodontist or dentist every time you get new trays? I’m only on my 2nd set of trays, but they gave me two sets on the first day. My first appt is set for next Tuesday, which will be a month after receiving my first set of trays. Let me know if you have any other questions below! OR, if you’ve had Invisalign and have any tips or tips or tricks for me, I’d love to hear them! 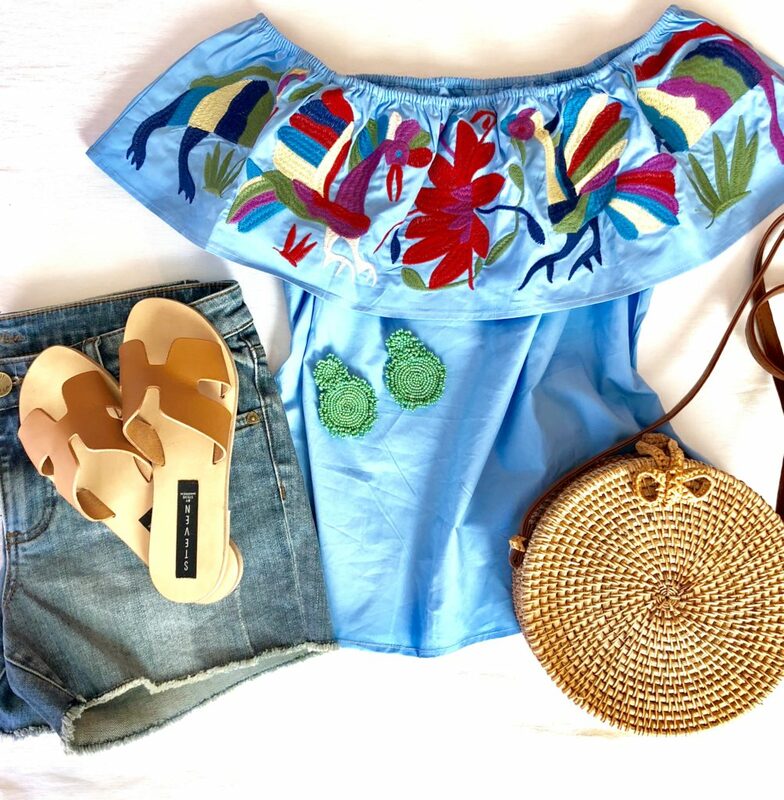 Those embroidered tops are so cute!! They scream “SUMMER”! Oh, yes. I will be wearing my retainers at night religiously once this is over!!! Thanks for the tip! So, we have to be a certain SIZE to wear something we LOVE?! I’m really disappointed, you have an influence, an opportunity to reach so many. How about encouraging women to wear whatever they choose regardless of size or the pressure to “fit” into something. I hardly ever comment, and hope you take this to heart. So many struggle trying to fit into what society and the media tell us what we should be. You have a lot of great items and opinions to share, maybe just leave comments like that out of it? Sheaffer, you’re awesome. We knew what you meant. Please don’t tamp down your lovely personality that comes through in your writing. It’s that authentic voice that keeps me coming back to your blog. I 100% agree with Karyl. I am one of the OG PTMT followers and I know how sensitive you are to your readers. Hellooooo…..your Special Mom giveaway?? We all have different shapes that clothes fit or don’t fit well. Summer body remark….pish posh! Agreed we all know what you meant! 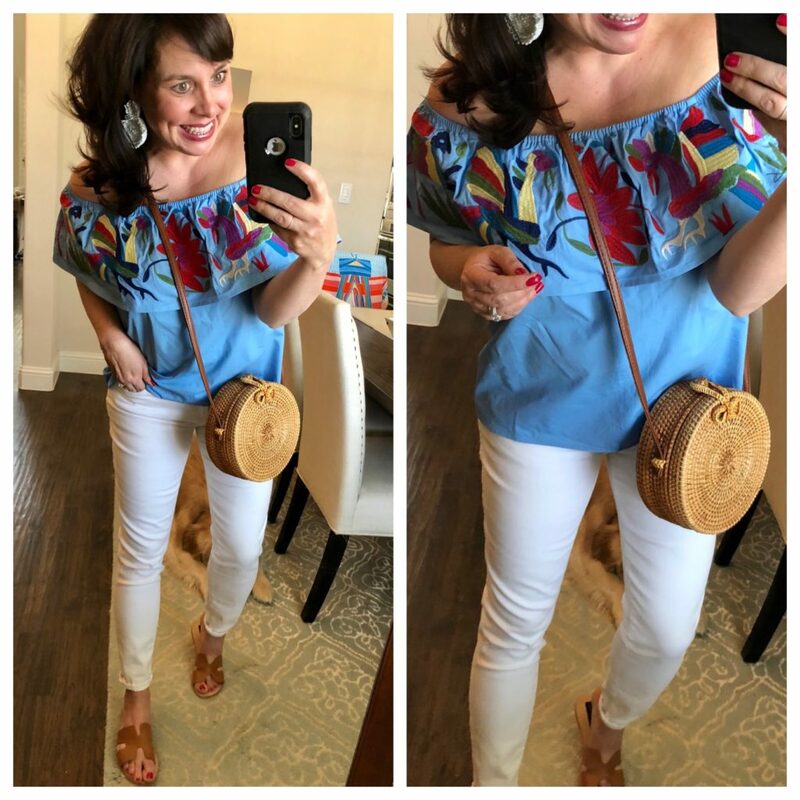 Transitioning into summer wear is real! Please keep on keeping on! So you are allowed to have feelings about your body but Sheaffer isn’t? If she feels she isn’t ready to wear this top, then she’s allowed to feel that way. That first pink top is absolutely adorable. It may need to live in my closet. Love all your March Amazon finds!! at the office to remove the trays – your office probably has it too. My treatment cost about the same as yours and fortunately was covered (partly, anyway) by my company’s new higher cap dental plan. Worth looking into if you’re thinking about it. I have Invisalign right now as well and one thing I have been using recently is a “tartar scraper tool” like the dentists use to get junk off of my trays. I am not sure if this is allowed but I am SO picky about them being clean! After about 10 days, my trays get SO loose, so I asked if mine could be shortened to every 12 days and she said yes (worth asking if you are feeling that way)! I have noticed that it is just better to eat at home…I put the trays in water while I am eating so the saliva doesn’t dry up on them 🙂 Oh and ask your dentist for some “chewies”, when you put in a new tray, there is something weirdly satisfying about them being tight, ha! I am going to check back to see tips from others! My husband never had braces as a kid, but should have. His teeth were extremely crooked, top and bottom and he got Invisalign when a periodontist friend told him that his bite was leading to grinding down of his upper and lower front 4 teeth and would result in painful, expensive gum surgery in the future. Plus, my dad never attended to a bite issue and now he has horrible teeth that shock me every time I see the change in his beautiful smile. Due to the extreme correction needed for my husband, he is 12 months into the process. The change is remarkable. He has had to wear new trays nearly every week, with only occasional two-week trays. Some weeks, particularily early on, new trays were very painful. Perhaps because he is changing trays so often, he was instructed to use toothpaste to clean them — takes forever! He is shocked at how dirty they get and he has stopped drinking coffee to reduce staining. Worth every penny! He does talk with a slur sometimes, but even though he’s on conference calls all day, people don’t seem to have noticed. Plus, it’s so common place now, people totally understand when he tells them what’s up. 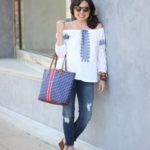 I love embroidered tops for summer! One of my favorites is from a website called http://www.sirensirensiren.com. I have the La Marbrisa sleeveless top in a green color. 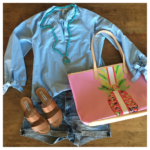 They are a bit cheaper than the Buddy Love tops and have a beach vibe that looks great with denim! Hi! I ordered your amazon find flutter sleeve dress and it came in yesterday. I was so disappointed. It stunk of some sort of chemical/gas smell. I’m so sad! Maybe I’ll try to order another one and see what happens. Oh no, Tifany! Mine didn’t have a smell at all! Did you try it on? Did you love it otherwise? I put it right back in the bag! Im going to reorder and see what happens. The smell was so strong I didn’t even want to put it in my body! These tops are so cute! I always have a hard time wearing the ones that cut across the bust like that, so appreciate your comments about needing to size up, etc.! Also, if you come across any longer-ish shorts that aren’t the tight bermudas, I would love to see them! I’ve officially hit my “early 40s” (41 next week) and some of the cute shorter shorts, I’m just not comfortable wearing anymore. But I also am not a huge fan of the “skinny” look of bermudas. Is there some sort of happy medium?!? LOL Thanks! Oh! You are correct, thank you! Hitting them up on my lunch break to try some on! Thank yoi! Oh my! I just checked out Red Dress. The handbags are abundant and gorgeous! Thanks for the tip. I’ll check out the dresses too but, 🐿, the bags! Hi, Tami! YES, the bags are good! And totally reasonable! Your blog and personality brighten my day like no other! That is all. Hi Sheaffer! I LOVE all of these tops! They are so cute and summery! I, too, am in the process of invisalign! I did 30 weeks and then had then re-scanned and now I am on my last 13 weeks. (I switch mine every week.) It is so strange sometimes speaking with them, but i find i get used to them and the pain has never been too bad which is good. I also got a tool from the orthodontist that helps with getting them off. I have to wear bands too 🙁 Boo! I feel like a 13 year old LOL! I try to wear them often, but they are somewhat embarrassing as well. 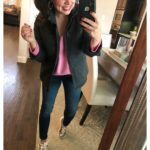 SO excited for you – I feel like invisalign has given me a new confidence as I am a big “smiler” and started feeling uncomfortable with how my teeth had shifted. You have such a beautiful smile!! Have a good day! Hi, Amy! All of y’alls comments are getting me so excited for the final results!!! I’m definitely going to be asking the dentist if I can wear them for less than 2 weeks at a time since I feel like the trays are so loose towards the end of the two weeks. Thanks, Amy! I’m about at the 18 mo. mark of Invisalign. I had the same issue… not wearing my retainer for almost 20 years. Ack! I don’t have any tips/tricks just a comment about how I had no idea how often I was eating until I got Invisalign! That was the trickiest part for me. Well, that and having to take them out in front of others… I always go the bathroom at restaurants to do it or just not wear them on communion Sundays at church. I will say that I am VERY pleased with the results! AH! I would have never thought of communion; I am getting invisalign next month. SO GLAD I read your comment before I get up to the front of the communion line and don’t know what to do. Whew! Hi Sheaffer! Do you happen to have any information on the gold slides the model is wearing in that last pic with the denim shirt and white pants? They look super cute, but not sure how comfy they would be (although for $18 maybe I’ll just try them)! Hi, Shell! I don’t. So sorry! I’m at the year mark for Invisalign. I’m on my 3rd revision and I wear my trays for 7 days at a time. Throughout treatment I’ve had times where I was told to change them every 10, 7, or 5 days. I’m really bad about leaving them out after I take them out to eat so that’s probably why I’m on my 3rd revision. I just use my fingernail on the back left corners to pop them out. I did have one tray actually tear but it was only a day from time to switch so I just went ahead and bumped to the next set, however I’m more gentle now. I started out brushing them every time I’d take them out but now I just pop them back in and swish some water. It’s hard for me to make time to run to the bathroom at work to brush them every time I snack or have a coffee and I figured I’d rather wear them than keep them super super clean. I brush them with my toothbrush and toothpaste like my teeth and have had NO problems with this after umpteen trays. I also had braces when I was younger and this is much better. I hope your experience is as good as mine has been. but over quicker! I’ve had Invisalign for 11 weeks and switch mine every week. I also use an Acceledent to speed up the process. My dentist recommended it. It looks like a mouth guard and vibrates gently. I use it every night for twenty minutes, it times itself and shuts off. I did have a misshapen ten week bottom tray and had to have it remolded. My dentist said he’d never seen that happen before, but if you can’t get a tray in when you switch, look at it carefully and compare it to the week you just finished and the following week. I could see the problem. I’m so interested in reading about your invisalign since I’m considering getting it. My teeth were straight as a child, but shifted in the past few years and its painful. Hi Sheaffer! I’m the reader that told you about the “Pultool”. I ordered it off of Amazon (of course!). It is a MUST HAVE if you have a lot of attachments. I was killing my fingernails and my gums trying to get my trays out. I switch my trays every week and had an appointment with my ortho today to get the rest of my trays for this first round (tray 11 tonight🎉). I showed him my Pultool and he loved it. He said they have a tool in the office but it’s not near as cool as this. So yay! Orthodontist approved! And it was a lifesaver for me. Also, I put my trays in a little bowl of 1 oz water and 1 oz hydrogen peroxide every time I take them out at home. It keeps them bacteria free and sparkling clean. And I am also diligent about wearing them 22 hours a day. I even set my stop watch on my Apple Watch so I can remember how long I have for dinner each night (mom brain😉). I am so excited because I found out today that after tray 17 they will rescan and order the next round of trays. And while we’re waiting for them to come in, I will get about a 4 week break where I just wear my last set of trays only at night! All I can think about is all the impromptu snacking that will be happening. Starbucks I’m coming for you in 6 weeks!!! So glad you found it! I have 2 – one for my purse and one for my bathroom. Should have told you that earlier!! No I don’t really feel like I have extra glue around them. But they are really rough. Especially on my upper incisors. I literally feel like I have fangs. The first couple of weeks they were super rough and it was less painful to have the trays in, than when they were out. The attachments would scratch the insides of my lips and cheeks when I was eating. I was using numbing mouth antibiotic ointment all the time. But now they have smoothed out a little and don’t really bother me. I did a lot of research online after I got them (maybe should have done that before?? Ha) and did read that the ortho can smooth them out some if they’re too bothersome. You might want to do that. All great tips!!!! Keep ’em coming, Alisa! Thank you! I am on my 10th week of Invisalign. I change my trays every 7 days. The excess glue bothered me too. The orthodontist can get it off. Good to know! Thanks, Donna! OMG! I had my first appointment today for Invisalign. How funny! I also had braces years ago and noticed my teeth moving just recently. Thanks for all the tips! I’ll be getting mine in the next few weeks. 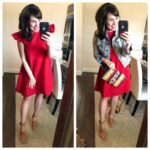 I love your blog and all you do to provide women with style tips and tricks. I have purchased many items because of your suggestions and just find you relatable! Keep being you and I appreciate the summer bod comment! We all have things we want to work on. Nothing wrong with having a goal. I’m on week 27 of my 39 week treatment and the results have been amazing so far. I forgot what it was like to have straight teeth on the bottom. Ask your doctor about Ortho Pulse. It’s a special tool that I use every night that helps speed up the treatment plan. It did cost extra $$$ but it cut my treatment time in half and I change my aligners every week! Also, taking them off was really hard for me the first month but now it’s second nature and the pop right out. You’ll be a pro in no time!! Good luck! Asking about Ortho Pulse for sure! Thank you, Tara!!! I did the Invisalign a couple of years ago and I’m thrilled with the results! I too had trouble removing the trays (especially the first day I switched to a new one). I keep some medical type gloves in my kitchen to wear for mixing meatloaf, etc. I found that slipping one of those on my hand gave me just enough grip and friction to easily remove the liner tray. I just keep one handy in a bathroom drawer. Hope that helps! Hi Sheaffer! I also recently started Invisalign and love knowing that I’m not the only non-teenager doing this, LOL! Thank you for sharing your experience; reading through these comments is super helpful. I have heard many similar tips. Based on my experience and discussions with my dentist, I agree that you should ask about the vibrating mouth piece and also wearing your aligners for a shorter amount of time. I wear mine weekly; my plan has 19 aligners. My bottom teeth are also way more crooked than yours, so I was surprised to hear that your treatment time is longer. Although, after my 19 aligners, they’ll take my attachments off and then I’ll have to wear the retainers basically full time for a few months before nighttime only, so maybe that time is also included in your plan. The weekly changes also help with keeping the aligners clean, since you’re wearing them for less time. Wishing you the best of luck and hope you get the exact results you want!! Hi! I was so excited to see you just started Invisalign! I love reading about people’s tips and tricks. I am on my 3rd tray of a system called Impressions. It uses the same method of Invisalign and is manufactured by the same company, but is half the price and you only have to go to the orthodontist twice during the process. I am wearing mine for 6 months. I wear mine 22 hours a day too and haven’t had any problems with them so far. The hardest thing for me is eating breakfast and snacks. I also eat in the car in the way to work, so I started eating while I got ready so I could brush my teeth before leaving and snap them in. One tip I have is to download the Invisalign app. You enter your information and ID number and it allows you to take pictures of your journey so you can see how your teeth change. It has a calendar so it reminds you when to change out your aligners. It also has a timer that counts up so you can track how long your retainer had been out. I look forward to see your updates on your Invisalign journey! I was so amazed when I went to my orthodontist appointment that there were more adults than children wanted braces. It just shows how wonderful technology is and how affordable and convey braces have become. Thanks for all the great tips, Christin!! !